POWERSLIDE Megacruiser 3x125mm Black Frames Set ready to roll! The Megacruiser 125 frames belong to our “Unity” frame family. These frames are unique in the market, based on a new, pat. pending manufacturing process. It is the first 3-D stamped and bended frame made out of one piece aluminium. Aluminium alloys are alloys in which aluminium is the predominant metal. The typical alloying elements are copper, magnesium, manganese, silicon and zinc. The 6063 aircraft aluminium we use for the Megacruiser 125 frame contains more magnesium and silizium which gives the material more elasticity which is easy to work with. It has less tensile strength than 7000 series aluminium; important for the strength and rigidity of the frames. The frame is also T6 heat treated. The Megacruiser 125 frame is very well balanced and stiff. All frames belonging to the “Unity family” are super low. The 3-D structure adds stiffness to the overall construction while keeping the weight as low as possible. Around the mounting platforms we added some foam shock absorbers to make your ride even more comfortable. This frame is a pure eyecatcher, not just because it features 3x 125mm mega size wheels. The gold color anodizing and stylish graphics is giving the frame its unique look. With just 255mm length is this frame short as a 4x 84mm frame. The center wheel acts like a turning point making this frame super agile and fun to skate. 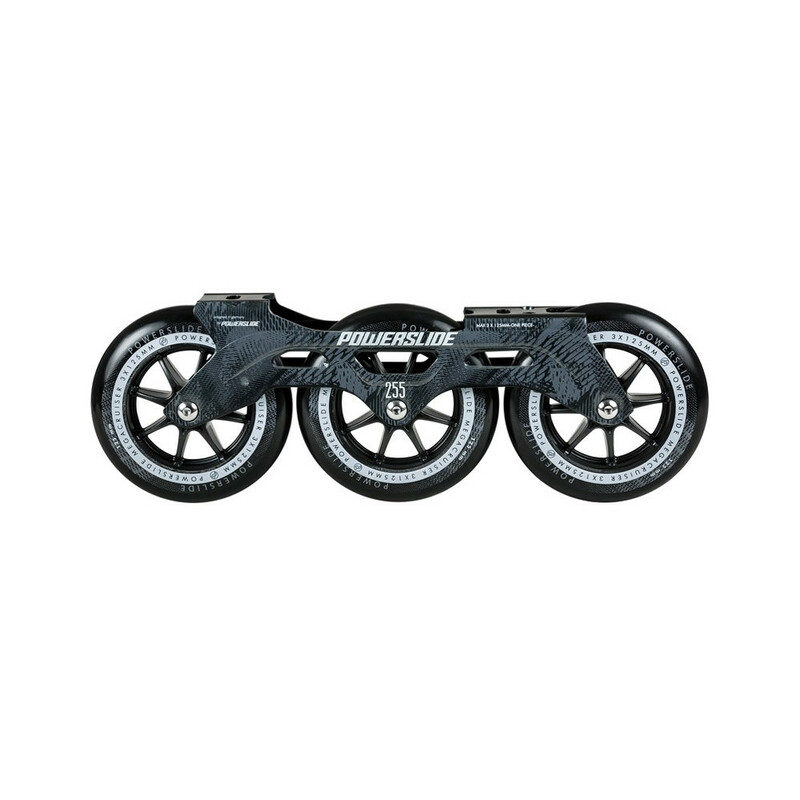 The Megacruiser 125 frame features the 165mm mounting standard, which fits all common freeskates and a lot of fitness skates as well. Check it out or contact your local dealer if you are not sure if the frame will fit your skates. The frame comes with standard double axles with hex head. The combination of the across slot in the frame and the along slot in our boots is called the X-Slot Mounting. This system enables the skater to adjust the boot-frame setup without any dead spot according to his skating style and preferences. 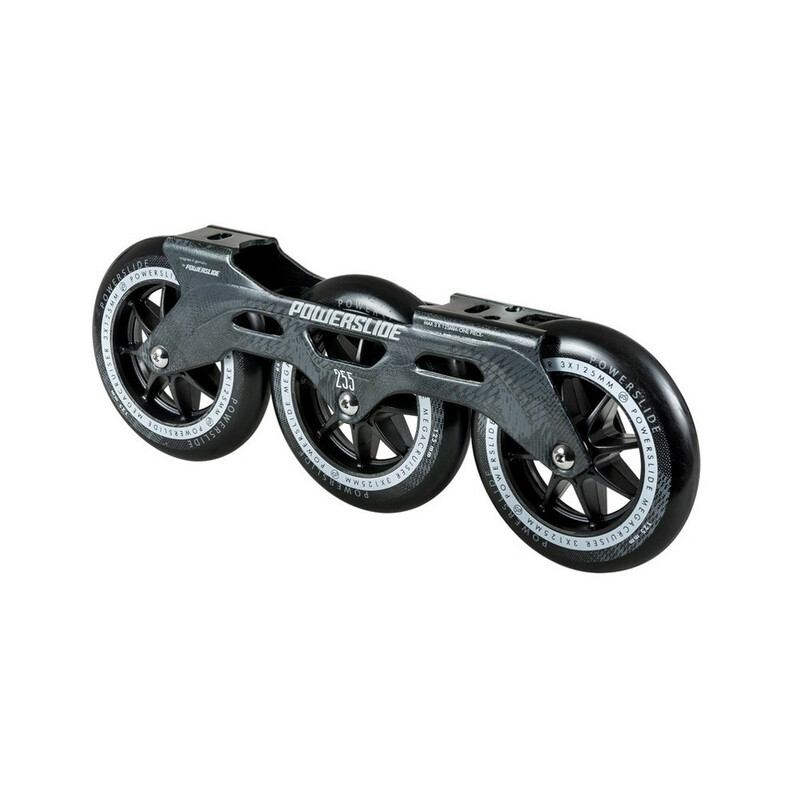 Powerslide Megacruiser 125mm wheels are MD Super High Rebound (SHR) wheels. The pleasurethane PU compound gives the skater all they need – super fast roll, good grip, long lifetime. The 7-spoke hub is very strong and durable. The wheels come in a 85A hardness which is a great compromise of speed, grip and shock absorption.